In Part 1, Understanding the 4-Week Block: Advancing our Training Program I touched on some basic ideas of setting up a 4-week cycle for our training. This is not only important for helping us advance our training and reach our goals but, it is also helpful in making sure that we don’t get injured, as we now have a planned system that effectively loads and unloads the body during a given training cycle. In Part 2, we are going to determine what our goals are and talk about how we can organize over a longer period of time. Choosing a goal can be difficult for most. Everyone wants everything and they want it NOW. Unfortunately, things don’t work that way. Being big is a good goal and being ripped is a good goal; however, it is tough to be all of those things at once (without pharmacological intervention at least). You can’t serve to many masters! So, we pick one goal first and focus on that and then we transition into our next goal. Obviously, diet is going to play a huge role in whether or not we can gain muscle or lose body fat – this is primarily the reason why we can’t gain a huge amount of muscle mass and lose weight at the same time (unless you are total beginner to exercise and have a lot of body fat to lose). You need a surplus of calories in order for hypertrophy (muscle growth) to take place and you need to limit calories in order for fat loss to take place. If the calories are to high, fat loss wont occur and if the calories are to low, you have no energy to go towards repairing the cellular damage that is taking place from training. *Note I left out power because for most trainees, unless they are training for sports performance or a strength sport, there is not much of a reason to use this. In addition, the three terms above can be a little misleading in that hypertrophy can take place in any of those rep ranges provided adequate calories are consumed. However, for lack of a better term, “hypertrophy” is what I chose to represent the 6-8 rep range. Typically, I would refer to that as submaximal or repetitive effort work, and then everything in the 10-15 rep range I would call auxiliary or assistance work. For the purposes of this article, since it is not geared towards sports performance, the terms above will refer to the corresponding rep ranges. The only thing that varies between the phases is the volume of work performed in each of the rep ranges. In the muscle building phase, when more calories are being consumed, we can handle more strength work and higher intensities. In the fat loss phase, when less calories are being consumed, we will do more in the hypertrophy and muscle endurance work to elevate the metabolic demands of the body; however, a low volume of strength work will be needed to help maintain muscle mass and ensure that we don’t loose the adaptation that we have worked so hard to achieve in our previous phase of training. Once you have established the goals for each of your 4-week blocks, it is time to get started. a.) Unless you are a total beginner, after a certain point in your training career, you will find that the first exercise will get the most focus and then everything else in the workout tends to go down hill. So, you wont be able to use the same intensity for each exercise in the workout. b.) Training everything with one intensity or one rep range, does not represent the broad scope of our goals above. Because of these issues, my advice would be to pick a lift to focus on during each training session and then have the other exercises represent the other rep ranges that fall into the secondary and tertiary goals of our 4-week block. If you were training on a 3-day routine, that would mean that you are going to have a push focus on one day, a lower body focus on another day and a pull focus on the final day. Everything else on those days would fall into a different training category (IE, push focus on day one and then pull and lower body are trained as hypertrophy and muscle endurance). As you can see in the program, in this initial “break in phase”, we are using a low volume of strength work (the first exercise in each workout) and then following it with our hypertrophy work (the second pairing and first exercise of the 3rd pairing) and our muscular endurance work (the second exercise in the third pairing). In Part 3, we will put together the last 2 training blocks and walk away with a full 12-week training program. your own training programs and workouts. 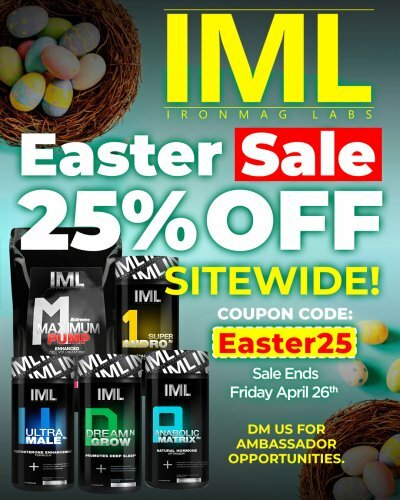 * This article is EXCLUSIVE to IronMagazine.com, reproduction in any form without prior consent is strictly PROHIBITED. My Case For Legalizing Drugs!